***(Box Set Deal, Not Free) The Gone Trilogy (Deal, Not Free) by Stacy Claflin. Price: $0.99. Genre: Suspense Thriller Box Set Deal of the Day, Sponsor, Kidnapping, Crime Thriller, Suspense. Rated: 4.8 stars on 129 Reviews. 652 pages. ASIN: B00SCC1CCS. *(Box Set Deal, Not Free) Montana Mail Order Bride Box Set (Westward Series)- Books 1 – 3: Clean Historical Mail Order Bride Collection (Deal, Not Free) by Linda Bridey. Price: $0.99. Genre: Clean Romance Box Set Deal of the Day, Sponsor, Mail Order Bride Romance, Victorian Romance. Rated: 4.7 stars on 21 Reviews. 510 pages. ASIN: B00MGVQ9QK. *(Box Set Deal, Not Free) Ghost of The Past Series Box Set – 4 Contemporary Romance Novels in 1 (Deal, Not Free) by Trisha Grace. Price: $0.99. Genre: Christian Romance Box Set Deal of the Day, Sponsor, Christian Mystery & Suspense, Inspirational. Rated: 5 stars on 2 Reviews. 882 pages. ASIN: B017M1H48A. *(Box Set Deal, Not Free) Montana Mail Order Bride Box Set (Westward Series)- Books 1 – 3: Clean Historical Mail Order Bride Collection (Deal, Not Free) by Linda Bridey. Price: $0.99. Genre: Clean Romance Box Set Deal of the Day, Sponsor, Mail Order Bride Romance, Christian Romance, Victorian Romance. Rated: 4.7 stars on 21 Reviews. 510 pages. ASIN: B00MGVQ9QK. $1 Steamy Military Romance Deal – an Enjoyable Complete Series! $1 Steamy Military Romance Box Set Deal of the Day! 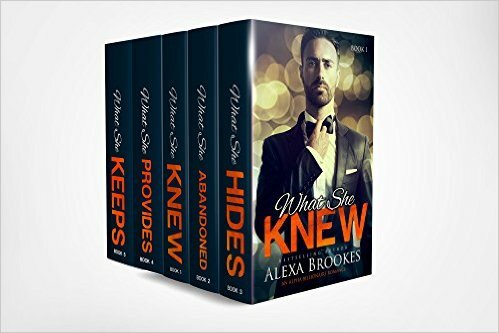 *What She KNEW (What She Knew Complete Box Set Series) (An Alpha Billionaire Romance) (Deal, Not Free) by Alexa Brookes. Price: $0.99. Genre: Steamy Romance Deal of the Day, Sponsor, Military Romance, Military, Sports. Rated: 4.4 stars on 34 Reviews. 154 pages. ASIN: B01H4EB0YE. *(Box Set Deal, Not Free) The Henry Gallant Saga – Books 1-4 (Deal, Not Free) by H. Peter Alesso. Price: $0.99. Genre: Science Fiction Box Set Deal of the Day, Sponsor, Space Opera, Adventure, Thrilling Science Fiction, Space Exploration, Colonization, Galactic Empire, Genetic Engineering. Rated: 5 stars on 5 Reviews. 839 pages. ASIN: B01F7S9OYW. *(Box Set Deal, Not Free) Heir of Scars I: Parts 1-8 (Deal, Not Free) by Jacob Falling, Vanessa Bettencourt. Price: $0.99. Genre: Fantasy Box Set Deal of the Day, Sponsor, Sea Adventures, Metaphysical & Visionary, Women’s Adventure, Coming of Age, Epic Fantasy. Rated: 5 stars on 1 Reviews. 606 pages. ASIN: B01G0YM5RU. *(Box Set Deal, Not Free) What She KNEW (What She Knew Complete Box Set Series) (An Alpha Billionaire Romance) (Deal, Not Free) by Alexa Brookes. Price: $0.99. Genre: Adult Romance Box Set Deal of the Day, Sponsor, Military Romance, Military, Sports. Rated: 4.4 stars on 34 Reviews. 154 pages. ASIN: B01H4EB0YE. $1 Steamy Romance Box Set Deal! 12 Books Including USA Today Bestsellers! $1 Fabulous Steamy Romance Box Set Deal! 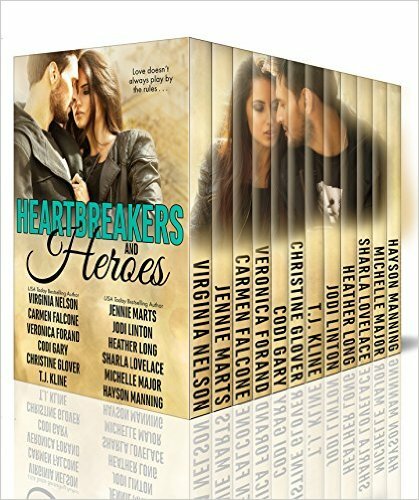 (Box Set Deal, Not Free) Heartbreakers and Heroes (Deal, Not Free) by Virginia Nelson, Jennie Marts, Michelle Major, Sharla Lovelace, Carmen Falcone, Codi Gary, Christine Glover, Veronica Forand, T.J. Kline, Jodi Linton, Hayson Manning, Heather Long. Price: $0.99. Genre: Steamy Romance Box Set Deal of the Day, Sponsor, USA Today Bestselling Authors, Sports Romance, Contemporary Romance. Rated: 5 stars on 1 Reviews. 900 pages. ASIN: B01DCR0LM4. 12 Book Box Set Inc USA Today Bestselling Authors. *West of the Dead Line (The Complete Series, Episodes 1 to 8) (Deal, Not Free) by Phil Truman. Price: $0.99. Genre: Western Fiction Box Set Deal of the Day, Sponsor, Historical Fiction, Complete Series. Rated: 5 stars on 2 Reviews. 180 Pages. ASIN: B00OY3B7BK. *Mercy Watts Box Set (Books 1-3, plus a Mercy Watts short) (Deal, Not Free) by A.W. Hartoin. Price: $0.99. Genre: Cozy Mystery Box Set Deal, Sponsor, Crafts & Hobbies, Women Sleuths. Rated: 5 stars on 3 Reviews. ASIN: B019KOYQKQ. $1 NY Times Bestselling Author Steamy Romance Box Set Deal! $1 NY Times Bestselling Author Box Set Deal! (Box Set Deal, Not Free) Alphas Unleashed: J.S. Scott Limited Edition Romance Collection (Deal, Not Free) by J. S. Scott. Price: $0.99. Genre: Steamy Romance Box Set Deal of the Day, Sponsor, NY Times Bestselling Author, New Adult & College Romance, Contemporary Romance. Rated: 5 stars on 28 Reviews. 527 pages. ASIN: B01FIUO20A. NY Times Bestselling Author J.S. Scott. *Tapestry Collection: A Boxed Set of Three Historical Romances (3 novel historical Romance Bundle) (Deal, Not Free) by Monica Barrie. Cost: $0.99. Genre: Victorian Romance Box Set Deal, Sponsor, Historical Romance, Western. Rated: 5 stars on 1 Reviews. 657 pages. ASIN: B01F4E1YDI.